It seems inevitable that anyone looking for an affordable Freeview HD Internet-enabled LED thinscreen will end up shortlisting the LG LA690V. This slick LED LCD TV ticks all the right boxes and won't break the bank. 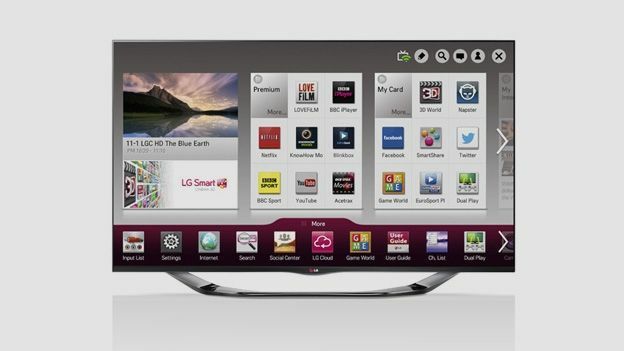 It's also available as the 47-inch LG 47LA906C and 55-inch LG 55LA60V, priced at £1199 and £1599 respectively. This is a ridiculously well-equipped TV for the money. It ships with the brand's innovative Magic Remote, which provides cursor-style control to navigate LG's online portal and web browser, and even comes with an NFC tag to simplify mobile pairing. A rich supply of Internet TV services are easily accessible via the intuitive UI, including BBC iPlayer, YouTube, Netflix, Lovefilm and others, while the set's media reader will accommodate most popular file formats. Four pairs of passive 3D glasses are supplied, plus two pairs of Dual Play gaming glasses. The latter allows split screen console games to be viewed full-screen simultaneously by duelling gamers (although some limited image breakthrough does rather take the edge off any hide and seek). Build quality and cosmetics are impressive; the super narrow bezel and dramatic ribbon stand makes the 42LA690 appear a class act. The panel is just 34.7mm thin. Connectivity includes three side-mounted HDMIs, a trio of USBs, Scart, component and composite video and Ethernet. Wi-Fi with Miracast mobile mirroring is also onboard. For the most part, the HD picture delivered by this set impresses. Colours enjoy a luminosity which is easy on the eye, and the set's black level passes muster. While the 42LA690V doesn't do really deep blacks, night scenes are rendered smoothly and there's appreciable shadow detail. The caveat, such as it is, lies with the screens' video processing, or lack of it. The TV doesn't offer high levels of motion clarity. Even if you engage the most aggressive TruMotion picture processing mode, you'll struggle to achieve much more than 700 lines of motion clarity. For general TV and movies this isn't an issue, but it prevents the screen delivering the sharpest sports coverage. Overall, LG's funky 42-incher is solid value. With a super narrow bezel and distinctive metallic trim, it's reassuringly well built for the price and offers a futuristic feature set, including NFC and Miracast Screen mirroring. While HD image quality is subjectively fine, the lack of advanced picture processing does rather limit its overall performance in terms of motion clarity. Still given the ticket price, this is quite understandable. Audio quality is pleasingly fulsome, thanks to the added bark of the 12w back panel woofer. All things considered, we rate this is a sophisticated sub-£1k offering.